Due to cancellation, 20th April to 27th April now £275 + £50 refundable bond. 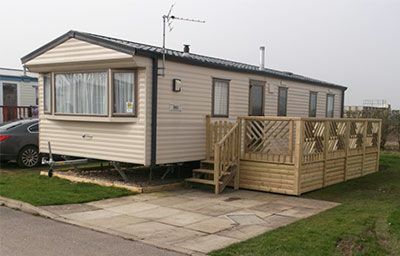 Situated on the popular Beech Grove area of Flamingo Land our 2011 Willerby Rio 35ft x 12ft, double glazed caravan is now available for hire. Competitive rates. Sleeps 6 in 3 bedrooms (one double and two twin rooms) all with cupboard and wardrobe space plus hot air plinth heaters in all bedrooms. Fresh linen is provided for your stay (i.e. bedding) however guests should bring their own towels and T-towels. The spacious lounge is equipped with a gas fire, a 32inch HD ready TV with Freeview and a built-in DVD player, a selection of DVDs and books, a PS2 with a selection of games and a CD player. The fully fitted kitchen is complete with a gas oven and hob, a fridge with a freezer compartment, microwave oven, toaster, kettle, grill, cutlery, crockery pots and pans. A vacuum cleaner, iron and ironing board are also provided. The caravan has a spacious shower and W.C with another separate W.C. There is a parking space at the side of the caravan including a decking area. All gas and electricity is included in the price. Unlimited Access wristbands must be purchases from Flamingoland reception on arrival. £50 bond will secure your booking, this will be refunded to you within 7 days of your departure.